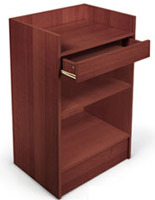 This hostess register stand is a versatile checkout or service counter that will complement any retail, commercial, or hospitality environment. 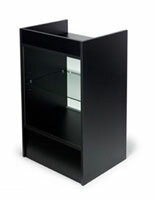 Each 38" tall fixture is sized to coordinate with standard size cashwraps or merchandise displays. 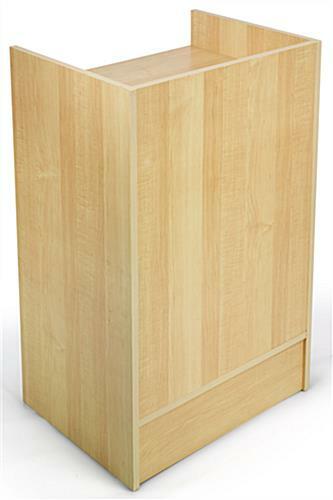 The economy checkout register stand is made of durable lightweight particleboard with a maple melamine laminate finish. 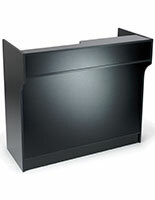 Each 24" wide service counter is designed for use alone as a freestanding countertop or as part of a larger multi-fixture configuration. 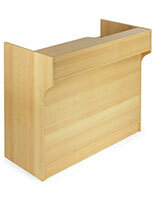 This versatile maple finish register stand is ideal for use as retail or hospitality furniture. 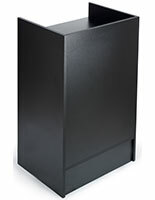 In addition to a recessesd countertop for point of sale equipment or purchase processing, the stylish counter features a rear pull-out drawer and adjustable shelving for storage or accessories. This modern checkout stand coordinates with any decor or environment. 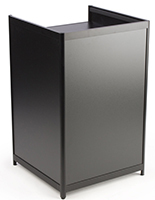 The maple finish service counter offers workspace for processing payments or wrapping purchases, as well as hidden storage for supplies, merchandise, and accessories. 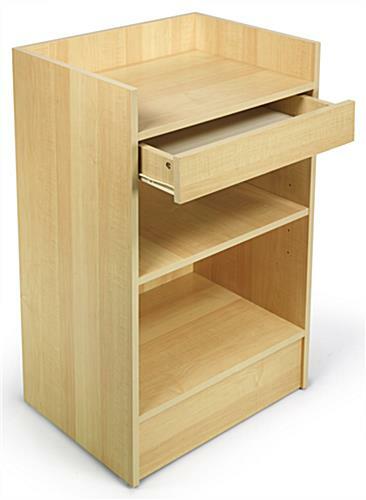 This economy retail service stand is a perfect choice for retail sales, restaurant, commercial business, and storefront use. Please Note: Fixture ships unassembled. 23.5" x 38.0" x 17.5"